well im sitting here waiting for the cable guy so ive been doing some research. shavedmax initially gave me the rodeo axle idea, but i though there were no diff options...till i found out they have dana44 diffs! which is awesome btw. here is some more info to help find the exact rear. this attests to the d44's strength. survives a 11 second 3200 pound vehicle. and i do remember running my bronco in fwd for about a week while i waited for a driveshaft and spinning the crap out of the front 33s with no harm..
pinion	standard D44 pinion	Larger diameter pinion shaft requiring a different ID on the pinion bearing... or a different bearing. ABS	Single ABS sensor on pumpkin or two in the tubes. 98 (possibly 99) LSD was optional. 00+ all had mandatory LSD. G80 option code does not apply to 2nd gen.
and im looking at about 600 bones to fit 3.73 gears, an auburn lsd, and the install kit. Why run it as stand-alone? MegaSquirt does not have an MIL, so the light will never light. 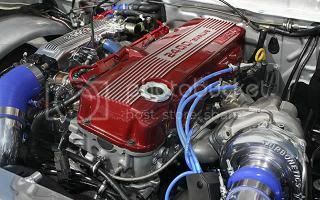 I'm running MSIIv3.0 on a 4AGE, with Honda injectors, Ford EDIS-4 ignition, GSXR ITB's and a GM TPS. It's not hard to work with at all. nice research! gonna save a bunch of guys some time. I like the look,love the dimpled bumper for the intercooler. So are you still auto x ing the truck. What have you done to get it to handle better? I like your thinking on the rear end. Look forward to see some updates on that. +++++1 for these. These are on my future purchase list. yeah, me too, its just so bitter cold out and im still doing work outside! and put it in the HB. when i drive the pathy the steering is pretty quick, its gotta be a quicker ratio.